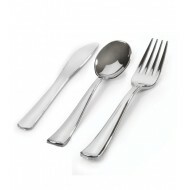 Make your event unique by using our extraordinary range of silver look plastic cutlery. 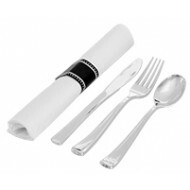 Our high-quality plastic cutlery collection is attractive and can transform any occasion, irrespective of its scale. 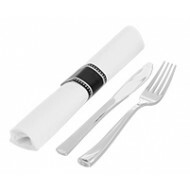 Our silver look plastic cutleries are ideal for any wedding, birthday party or event. We have a versatile and distinctive range of plastic cutleries that are easy to use, clean and maintain. In fact, they are designed to provide convenience and comfort to homeowners. Are you ready to make a style statement? Contact us now. 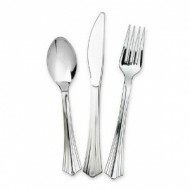 Partysettings.co.uk provides chic, silver look plastic cutlery ranges at the most reasonable rates. Pack includes 1 napkin, fork, spoon and knife. High quality aluminium coated plastic cutlery. .. Pack includes 1 napkin, fork anf knife. High quality aluminium coated plastic cutlery. A close.. Pack of 12 Silver metallic look plastic Spoons. .. Pack of 12 Silver metallic look knives with beautiful design. .. Pack of 12 Silver metallic look forks with beautiful design. ..